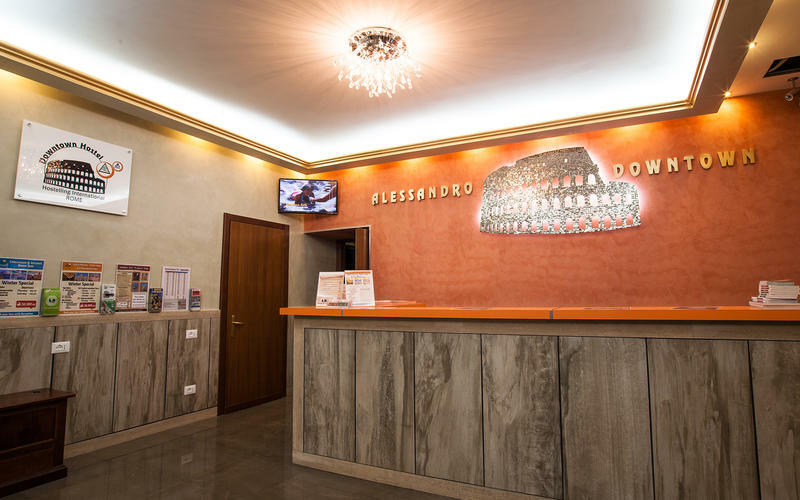 Continuing the same high standards of the original Alessandro Hostel, Hostel Alessandro Downtown was designed expressly for budget-minded backpackers.We have large, clean dorm rooms with shared bathrooms. All rooms have air conditioning and heating units (on energy-saving timers). Linen and blankets are included and lockers are available in all dorm rooms. There are also internet PCs in computer room (for a nominal fee) along with free Wi-Fi (hotspot) available throughout the building. Our large common room has a widescreen TV. Offering a wide variety of services at reasonable prices, our exceptional location provides a safe, convenient base to explore and enjoy Rome's sites.NEWS (Nov'2013)We now have kitchen available :)(open 4pm-10:30pm)Breakfast is available for 4 Euros and includes ham, cheese, jam and butter, bread, cereals, fruit, hot/cold drinks and milk. Self-service laundry is now available at the hostel. Itâ€™s just 4 Euros to wash up to 7kg and 4 Euros to dry up to 7kg. Soap is 1 Euro. Towels are available to rent and are included in the price of double rooms. Designed expressly with the budget conscious traveller in mind, our hostel boasts free city maps, a tourist info stand, vending machines and free luggage storage before check-in and after check-out. We also organise free parties and this is a meeting point for walking tours. The Colosseum, Roman Forum, Basilica Santa Maria Maggiore, and San Pietro in Vincoli are very close, less than half-an-hour away on foot, and all parts of the city are accessible with public transportation by Metro, bus and tram.As backpackers themselves, our staff are happy to offer tips and advice for the best deals in Rome.We have a high standard of security here, with key card access, lockers in all the dorms (please bring your own padlock), a video surveillance system, a fire alarm system and fire-proof doors. The shopping mecca of Spanish Steps, Trevi Fountain and the classy Via Veneto can all be reached on foot in approximately half an hour. Our central location means weâ€™re close to Termini station, bus stops, the metro, supermarkets and historic sites. We have discounts agreed with Laundromats and restaurants nearby!Please read our Things to Note below before booking. Airport pick-up can be arranged upon request.Fee for 1-4 persons with four suitcases: from 57 per car.Fee for 5-8 persons with one suitcase per person: from 12 per person.The stated price is minimum tariff; the fee varies depending on flight arrival time and airport (Fiumicino / Ciampino).It must be requested least three days prior to arrival as we need to check availability. For further details, please inquire by email AFTER making reservation.From Termini station:We're located a short five-minute walk from Termini train station.1. With the train tracks at your back, exit Termini Station by Track No.22 on the left-hand side of the station.2. Make a left on Via Giolitti and then take your second right down Via C.Cattaneo.3. Continue down Via Catttaneo until you reach #23 on the left side of the street.From Fiumicino Airport (Leonardo da Vinci):Follow the signs for 'ai treni' to the platform and buy a ticket for the non-stop train to Termini (Leonardo Express). You can purchase from either the ticket window, vending machines, or tobacco store near the platform. The Leonardo Express leaves every 30 minutes and the journey is about 30 minutes. A slightly cheaper (but slower) option is to take local train that has the final destination of either Orte or Fara Sabina. It will stop at a few small local stations heading into Rome, but it does not stop at Termini Train Station. You need to get off at Tiburtina station (about the eighth stop), and then follow the directions 'from Tiburtina' and then 'from Termini'. Trains leave approximately every 15-30 minutes and takes one to one-and-a-half hours.Important: Don't forget to validate your ticket with the little orange or yellow boxes before you get on the train!If you take a taxi, it is highly recommended to take it from official airport taxi stand, not private ones. Depending on the traffic, the journey should take 30-40 mintues and cost 40 to 45.Another easy way to reach city centre from Fiumicino is to take a shuttlebus which departs after every flight. We recommend Terravision service. Journey time is about 50 minutes. From Ciampino Airport (Usually RyanAir and Easyjet):The easiest way to reach city centre from Ciampino is to take a shuttlebus which departs after every flight. We recommend Terravision service. Journey time is about 45 minutes. The blue Cotral Bus service connects Ciampino Airport to the Anagnina metro (underground) station and costs approximately. Tickets can be purchased at the vending machines located at the bus stop or inside the airport. Once you arrive at Anagnina, buy a metro ticket and get off at the Termini stop (about the 15th stop). Follow the directions 'from Termini'. Journey time is about 1hr-1.5hrs.If you take a taxi, it is highly recommended to take it from official airport taxi stand, not private ones. Depending on traffic, journey time is about 30 to 40 minutes and should cost 35 to 40.From Tiburtina Train Station:Follow the signs for the Metro (Underground). Take Linea B (Line B) in the direction of Laurentina and get off at Termini station (the 4th stop). Then follow the directions 'from Termini'. Journey time is about 10 minutes. Metro tickets can be bought from either vending machines or tobacco stores located inside the train station. The Metro runs approximately every 5 - 15 minutes, depending on the time of day.